The CENTURION Industrial RSO range has been designed to safely automate extremely heavy roller-shutter doors such as entrances to factories and loading bays. Each model is equipped with a heavy-duty electric motor that, coupled with a powerful gearbox, delivers maximum lifting force. In addition, a convenient manual override facility comprising a five metre chain ensures that the door can be operated even in the event of a power failure. A three-button wall pendant allows the operator to not only open and close the door but also safely stop it should an emergency situation arise. The RSO5R3P is a powerful three-phase, 380V operator capable of delivering greater starting thrust than single-phase operators, and also boasts an increased duty cycle. You’ll find the perfect union of simplicity and raw, unadulterated power in the RSO5R3P industrial roller-shutter operator. This three-phase model provides the same reliable automation solution as the RSO5R – but with the added might of 380V behind it! That means an increased duty cycle and higher starting thrust– the RSO5R3P has the OOMPH-factor down to an art! Two words: Oblique gear. This proven transmission type, coupled with an AC motor that packs plenty of clout, makes for an industrial roller-shutter operator that makes quick work of even the heaviest of shutters. What is strength without reliability? In the unlikely event that something goes wrong, the RSO is committed to keeping you in business, with not one but two modes of manual operation. 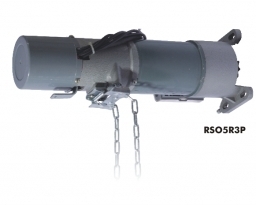 All RSO models come standard with a five metre hand chain, ensuring that the shutter can be easily operated even from ground level, as well as a manual-release pin inside the gearbox that can override the mechanical brake. The strength of a good industrial operator lies not in its complexity, but in its…you guessed it!…strength. The CENTURION RSO range of operators is exceptionally easy to set up, and commissioning can be done in mere minutes thanks to a user-friendly cam system. Two mechanical limit switches are the heroes that tame the beast, making sure that the shutter stops in the open and closed positions, every time. One can imagine that it takes quite a lot of muscle to keep such a colossus suspended several meters in the air – fortunately, CENTURION’s custom-made RSO mounting plates are more than up to the challenge, and includes vertical slots for easy adjustment of the operator.